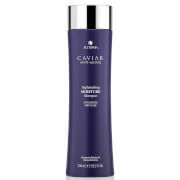 Bring life back to limp locks with the Alterna Caviar Volume Shampoo and Moisture Intense Pre-Shampoo Duo, a pair of products to boost hair from root to tip and replenish hydration, strength and visible healthiness. Deeply revitalise dehydrated strands with a pre-shampoo treatment infused with nourishing Abyssinian Oil and innovative anti-ageing crème. The advanced formula works to moisturise, hydrate and restore locks with health and enhanced shine, whilst a dose of Caviar Extract smoothens the hair fibre to leave it soft and sleek. Suitable for weekly use, the powerful treatment helps to repair dry to extremely dry hair so you can experience stronger strands from root to tip. Help to return brittle, lifeless hair back to its fullness and youthful radiance with a cleanser that restores volume, protects colour and improves the overall performance of fine hair. The shampoo provides essential amino acids to help rebuild and thicken the hair structure while infusing life into tired strands with super energised nutrients. The sulphate-free formula protects hair from the stress caused by the environment, the sun, ageing, chemical services and everyday styling damages. Locks are left visibly improved and truly healthy. 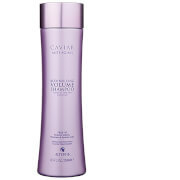 Suitable for limp, dry and damaged hair. Free from parabens, sulphates, phthalates and synthetic colour. Not tested on animals. Pre-Shampoo: Wet hands and emulsify product between palms before applying to dry, or towel dried hair. Apply from roots to ends. Leave on for 5-15 minutes, depending on level of dryness. Rinse. Follow with shampoo and conditioner. Pre-Shampoo: Water/Aqua/Eau, Cyclopentasiloxane, Dimethicone, Glycerin, Caviar Extract, Algae Extract, Hydrolyzed Pearl, Keratin, Hydrolyzed Keratin, Butyrospermum Parkii (Shea) Butter, Mauritia Flexuosa Fruit Oil, Persea Gratissima (Avocado) Oil, Crambe Abyssinica Seed Oil, Olea Europaea (Olive) Fruit Oil, Helianthus Annuus (Sunflower) Seed Oil, Hydrolyzed Vegetable Protein PG-Propyl Silanetriol, Dimethiconol, Phospholipids, Saccharomyces/Magnesium Ferment, Saccharomyces/Copper Ferment, Saccharomyces/Silicon Ferment, Saccharomyces/Zinc Ferment, Saccharomyces/Iron Ferment, Superoxide Dismutase, Panthenyl Ethyl Ether, Phytantriol, Polysilicone-15, Silicone Quaternium-3, Propylene Glycol Dicaprylate/Dicaprate, Caprylyl Glycol, Butylene Glycol, PPG-1 Trideceth-6, C10-40 Isoalkylamidopropylethyldimonium Ethosulfate, Behentrimonium Methosulfate, PEG-45M, Cetyl Alcohol, Trideceth-12, Ascorbic Acid, Polyquaternium-37, Sorbic Acid, Phenoxyethanol, Fragrance (Parfum). Shampoo: Water (Aqua), Cocamidopropyl Betaine, Sodium Methyl 2-Sulfolaurate, Disodium 2-Sulfolaurate, Sodium Methyl Cocoyl Taurate, Lauramide MEA, Acrylates/Vinyl Neodecanoate Crosspolymer, Glycereth-26, Caviar Extract, Algae Extract, Helianthus Annuus (Sunflower) Seed Oil, Macrocystis Pyrifera (Kelp) Extract, Linum Usitatissimum (Linseed) Seed Oil, Butyrospermum Parkii (Shea) Butter, Keratin, Hydrolyzed Keratin, Biotin, Phospholipids, Saccharomyces/Magnesium Ferment, Saccharomyces/Copper Ferment, Saccharomyces/Silicon Ferment, Saccharomyces/Zinc Ferment, Saccharomyces/Iron Ferment, Hydrolyzed Vegetable Protein PG-Propyl Silanetriol, Superoxide Dismutase, Ascorbic Acid, Polysilicone-15, Tocopherol, Glycerin, Panthenol, Sodium Lauroyl Sarcosinate, VP/DMAPA Acrylates Copolymer, Cetrimonium Chloride, PEG-150 Distearate, Disodium EDTA, Citric Acid, Butylene Glycol, Tetrasodium EDTA, Phenoxyethanol, Potassium Sorbate, Hydroxypropyl Cyclodextrin, Silicone Quaternium-8, Silicone Quaternium-16, Benzalkonium Chloride, Undeceth-11, Butyloctanol, Undeceth-5, Iodopropynyl Butylcarbamate, Methylchloroisothiazolinone, Methylisothiazolinone, Fragrance (Parfum).